New Zealand summers are great. You get to spend lots of time outdoors, hang out at the beach and have friends over for a BBQ. If only the days, and even more so the nights, weren’t as hot and sticky and humid. If your house turns into a sauna, getting good quality sleep can be tough. Having an Air Conditioner installed will not only cool down your rooms efficiently. It can also help you breathe better, especially if you suffer from allergies, and create the right environment for you to escape the heat and take a break. Air conditioning is a great investment in your own wellbeing. It will add value to your property, save you money in the long run and significantly increase your lifestyle. For a long time, the focus has been on heat pumps only, but modern systems bring you comfort all year round: a heat pump will keep your house cosy and comfortable during cold winter nights, and the integrated air conditioner will bring you relief from the scorching heat and humidity in summer. Air condition units make the summer heat a lot more bearable. However, unlike common belief, that does not happen by simply blowing cold air into the room. On the contrary. Air conditioners remove heat and moisture from the air, then use a fan to distribute that conditioned air into the designated space. And it’s all just the push of a button away. Air conditioners have gained a bad reputation in the past due to abnormally low temperatures and faulty maintenance. However, with the right settings, this technology will enhance your wellbeing and reduce the risk of illness. Being exposed to extreme heat has a negative impact on our performance and activity level. Lowering the temperature and reducing humidity in offices, living areas and bedrooms has beneficial effects. It not only reduces the number of insects in the air, it also helps get rid of common allergens that cause hayfever in many people. Air condition can also increase the level of physical and mental activity during the day and help get a good sleep at night. Lower body temperatures also mean a reduced risk of dehydration. Modern air conditioners come with a range of features and benefits that will improve the quality of your life immensely. Forget about noisy fans and ventilators that whoosh around any bits of paper that are left unsecured. Modern air conditioners are almost soundless and won’t affect the comfort of your home. The right air conditioner will provide smarter cooling, lowering the cost of your utility bill while allowing you to enjoy comfortable temperatures all year round. Are you concerned that installing air conditioning will affect the aesthetics of your home? With the Mitsubishi Electric’s Designer Series you don’t have to worry about a thing. 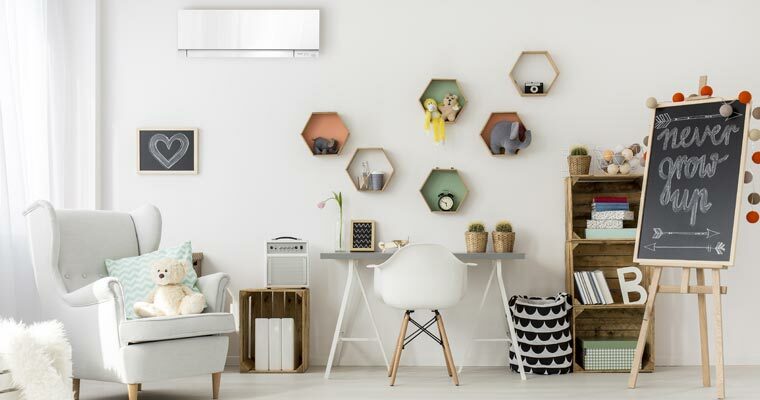 Mitsubishi air conditioners are designed to blend into your home’s décor, matching the style of existing appliances, so you will barely notice it’s there. All you will notice is the refreshing air that adds extra comfort to your life. 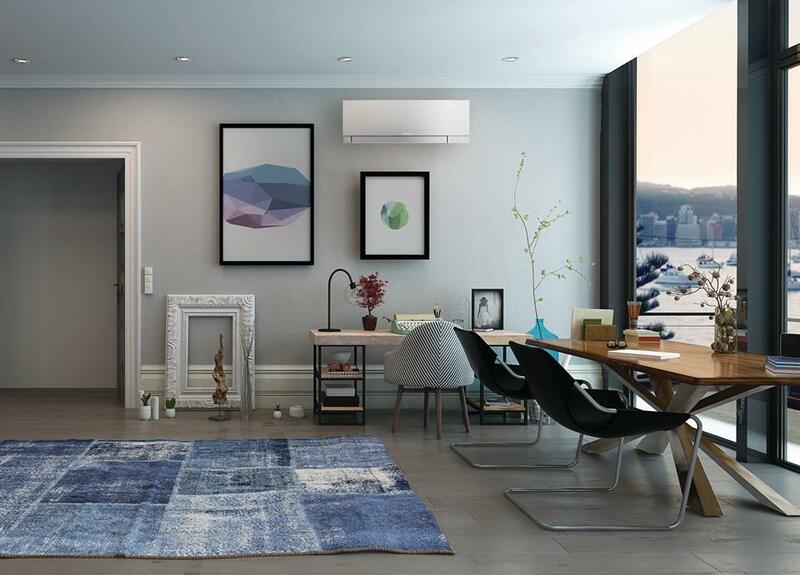 Mitsubishi is the leading manufacturer of air conditioners and heat pumps, providing families with clean, energy-efficient solutions that won’t blow your budget and even add a nice stylish touch to your home. Mitsubishi Electric Air Conditioners are designed to keep your house cool in summer and warm in winter. You won’t need anything else. Kiwis have trusted Mitsubishi for decades, and we do too. While you’re sweating outside in almost unbearable heat and humidity, imagine the joy of arriving at a perfectly cool and refreshing home after a long day. Mitsubishi Electric Wi-Fi Control means you can adjust the temperature of your home from wherever you are (even overseas!). In order to find the model that suits you best, give us a call and book your free consultation today. One of our air conditioner specialists will come and visit you at a time that suits you to assess the design and size of your home and the rooms within, measure average temperatures and recommend a style that works best with your surroundings. You will receive a free, non-obligation quote. The choice is yours. The more stars the air conditioner unit has, the more efficient it will be and the less money you are going to spend on utility bills. If you live in extreme climate conditions with very hot summers and very cold winters, you will need a more powerful air conditioner that performs well under these conditions. Also check the pump labels for capacity output and power input which are both measured in kilowatt (kw). The higher the ratio between both, the more efficient the unit. Meaning, the more kw the unit puts out in heat or cooling while using as little as possible kw to function, the better it will be for your power bill. It’s important to get an air conditioner that matches the size of the room or area it’s meant to operate in. If you choose a model that is too small, it will struggle to perform its task and end up being costlier to run. On the other hand, if the unit is too big, you are overspending on the initial investment without getting the desired results. Ask your installer whether they comply with the EECA Good Practice Guide for heat pump installation. This certifies that they have the knowledge and expertise to correctly locate and install indoor and outdoor units to ensure their optimum performance. If you are on a strict budget, you may be able to get help with the cost installing your air conditioner/heat pump system. Some local councils offer help by including the cost as part of your rates. You can find a list of councils on the EnergyWise website. If you have a mortgage, some banks are also offering help by being able to add the cost to your existing mortgage. Please keep in mind this would need to be paid back with interest over the term of your mortgage. You will also find a list of banks who offer this on the Energywise website. However, these initiatives do not usually cover multi-split and ducted heat pump systems. Also, don’t forget that if you have a SuperGold card, Potter Electrical can offer you a discount on the installation. Depending on your house and your needs you can choose between a variety of models. Would you rather have your air conditioner mounted to the walls, the floor or the ceiling? Do you need to be able to adjust the temperature in specific rooms only? Or would you prefer your air conditioner to work around the entire house? Wall mounted units are great if you already have limited floor space. They are ideal for bedrooms and living rooms and won’t disturb your daily life due to their extreme quietness. Out of sight, out of earshot. You will barely know they’re here. Floor console units can be a great replacement after renovation projects as they fit perfectly into spaces previously occupied by old fireplaces or old-fashioned heating systems. They are known for their ability to rapidly adjust the temperature in any room, making them more powerful and efficient in summer and winter time. Ceiling mounted units give you maximum flexibility without compromising floor or wall space. They come packed with a range of advanced features and settings, creating ultimate control and comfort. Enjoy maximum airflow as well as award-winning designs. Single-split systems are the most common ones in New Zealand with an indoor unit connected to an outdoor unit. They work well in smaller rooms and enclosed areas but are not designed to control the airflow in the entire house. Multi-split units have one outdoor unit serving multiple indoor units, allowing you to cool several rooms around the house. Ducted heat pumps provide central heating and cooling throughout the entire home and are perfect for larger areas and properties. The outdoor unit is installed in the roof cavity, and depending on the system you can either change settings for each room separately or the entire system operates on one central setting.